This week I had the pleasure to work an a Schecter Dream Machine. 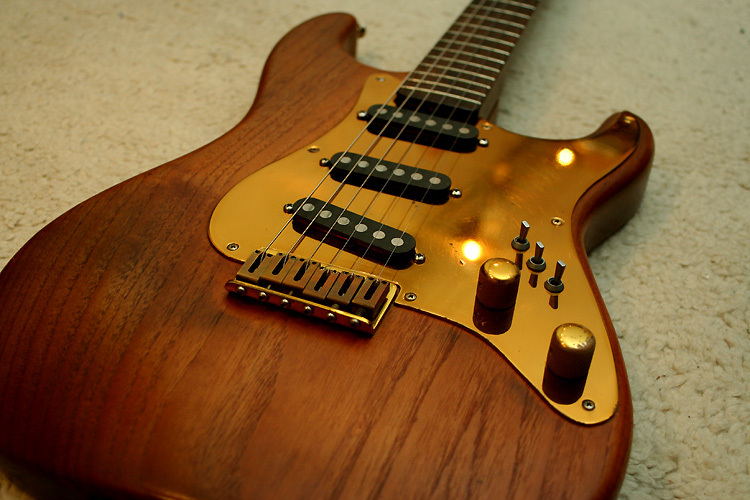 It is a really lovely hard-tail Strat with gold hardware. I am not sure about the wood (none of the codes that normally identify these) but the neck might be Pau Ferro (“Bolivian rosewood”). I am rather lost with the body, maybe ash that is stained, or Shedua, walnut,… ?? Any help is welcome so use the comment function to let me know what you think. 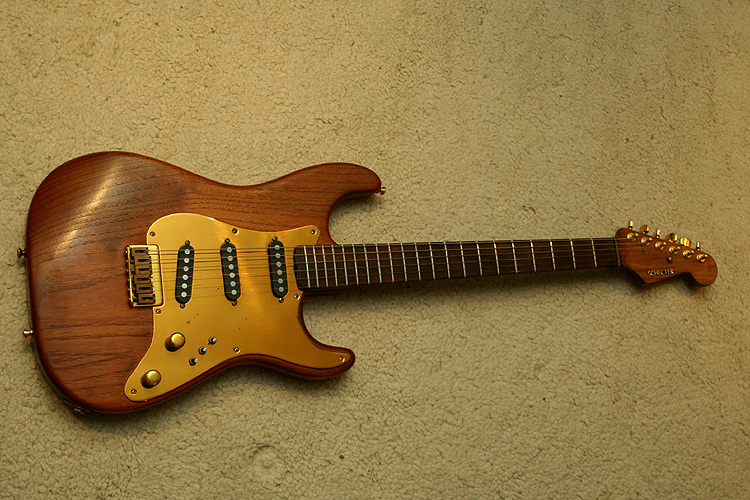 The main “problem” with the guitar is that the pickups have been replaced with some kind of Seymour Duncan Hotrail humbuckers – surely good pickups but at leat not my cup of tea for a Dream Machine. 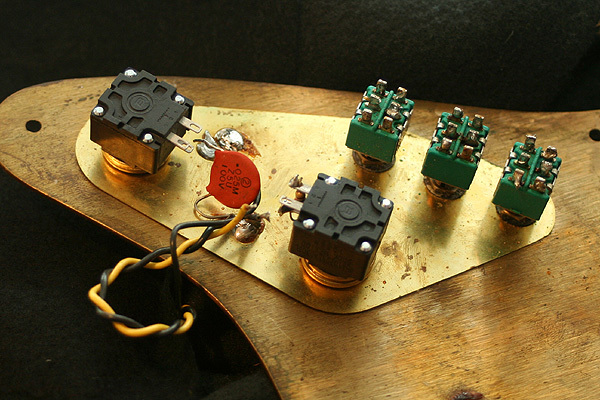 The Hotrails required a completely different wiring of the mini switches and also the addition of two push-pull switches. To be honest, I did not fully understand the way the up and down positions of the mini switches were combined with the two push-pull potis. 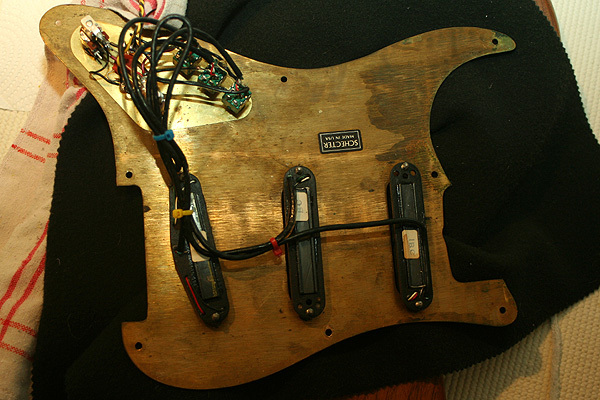 As I had a set of original F500T pickups waiting for a guitar like this, it was no question that these two had to come together. In the following you will find a photo tour that demonstrates the work – hoping some folks will find it interesting or useful. 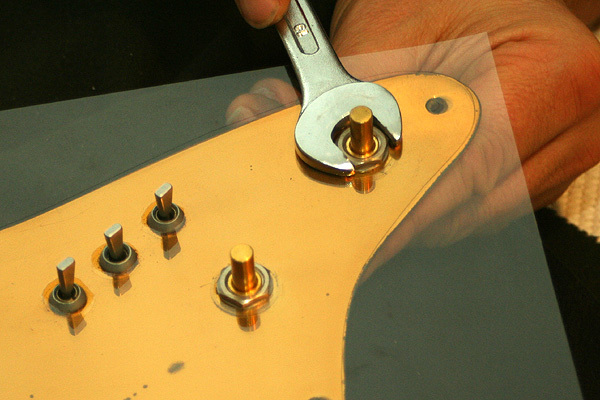 … and also this protective foil to not scratch the pickguard. 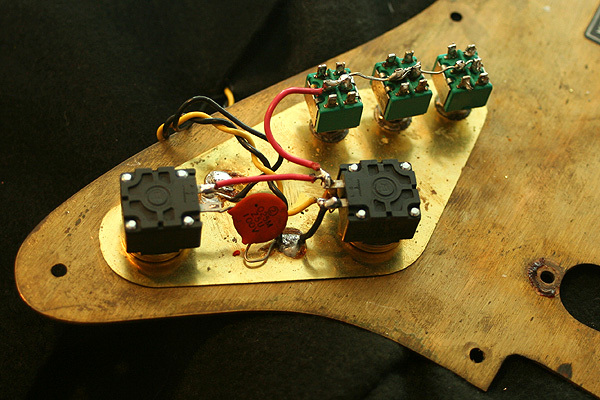 All connected, ready to install the pickups. 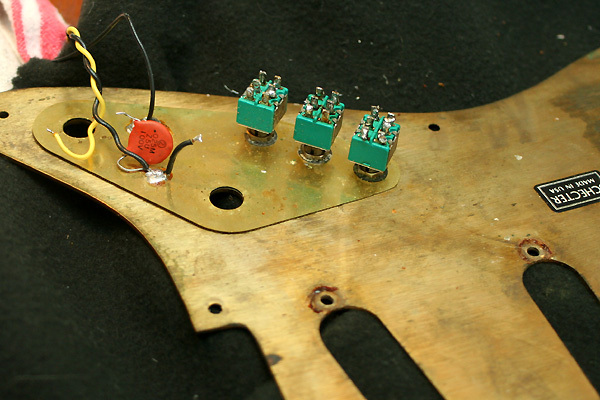 After assembling the pickups – it was a complete set with all wires still being taped together – I found it impossible to follow which wire end belongs to which of the three pickups. 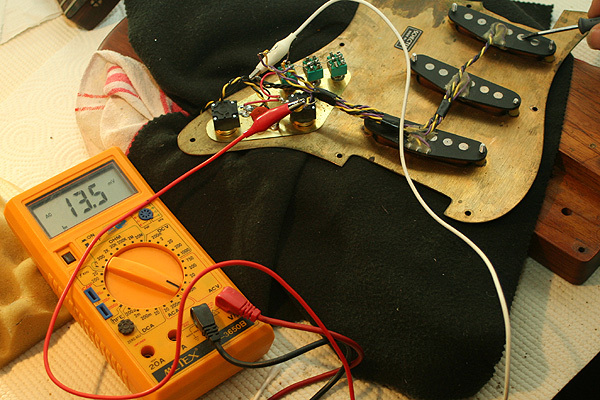 I connected a volts meter and touched the pickups with a screwdriver until the meter reacted to identify the corresponding pickup. 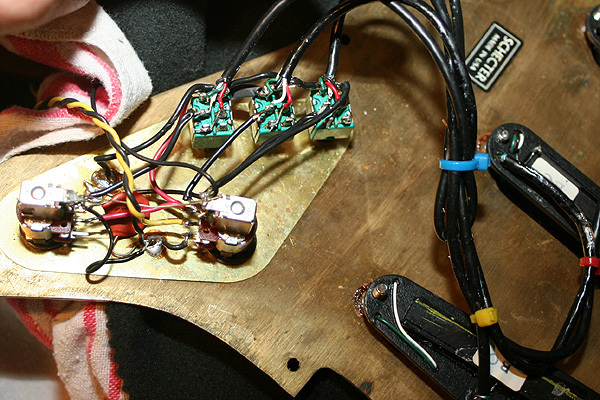 Which wire for which pickup?? 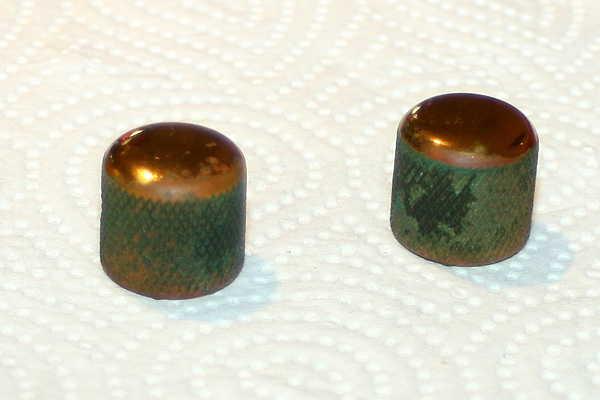 … but – one hour later after all kind of treatment I could think of – they came out like this. Watch out for more details and pictures of this wonderful guitar in a future blog post. Beautiful guitar – if I was to put money on it, I would say that is (stained) ash – doesn’t have the tight grain or dark lines of shedua and too wide a grain for walnut. Would love to get my hands on an original Dream Machine – one day maybe! Its really hard to find an original and untouched Dream Machine. 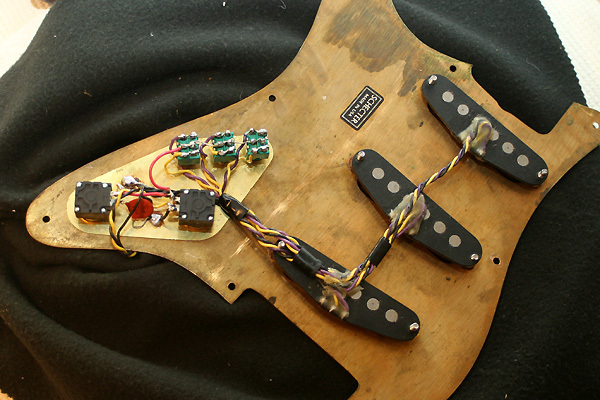 Normally, these kind of guitars seems to be very modified these days. 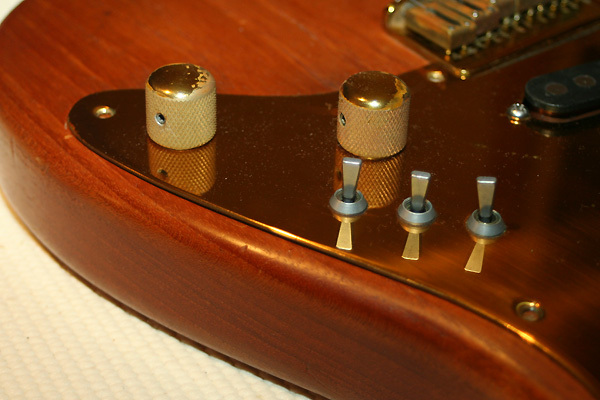 Ingo, “The Alchemy pickguard Set” has tapped pickups? If you ever decide to sell it, please let me know. Beautiful guitar! You did a great job with the electronics as well. Building one of these has been on my “to do” list for awhile. I look forward to hearing some sound clips and am curious what you think about the feel and tone of the woods. Do you like the Pau Ferro neck? 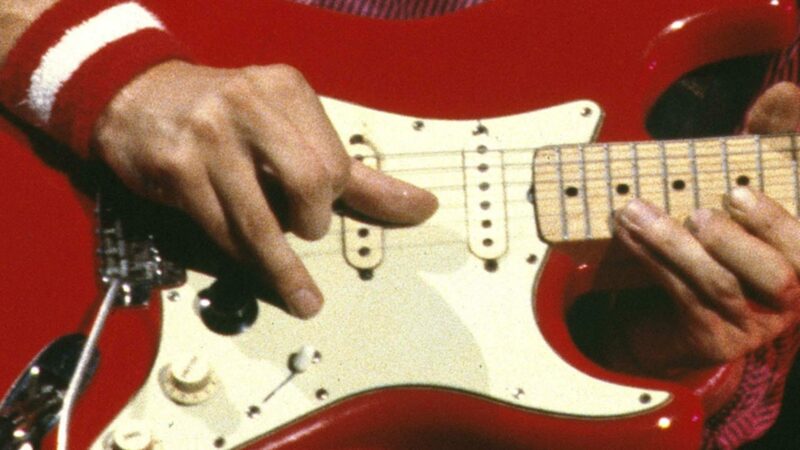 Hi Ingo, Did they ever make left handed ones? If so where do you think I can find one? Many thanks! 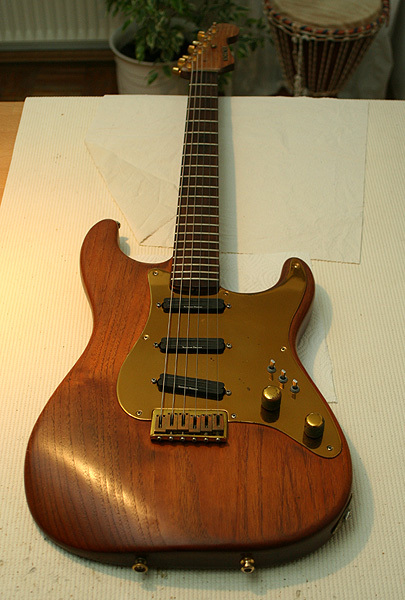 The 1980 Schecter catalogue mentioned left handed guitars on custom order. 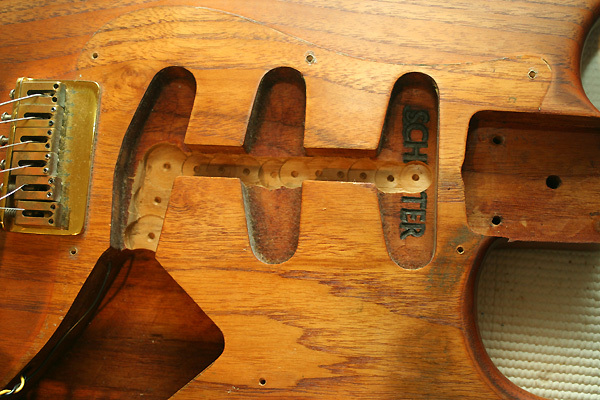 Who own this Schecter now? I want to buy it if it’s for sale. I have a totally original Candy apple red Schecter dream machine super strat with gold and brass hardware. Super birds eye maple neck and is almost mint condition. 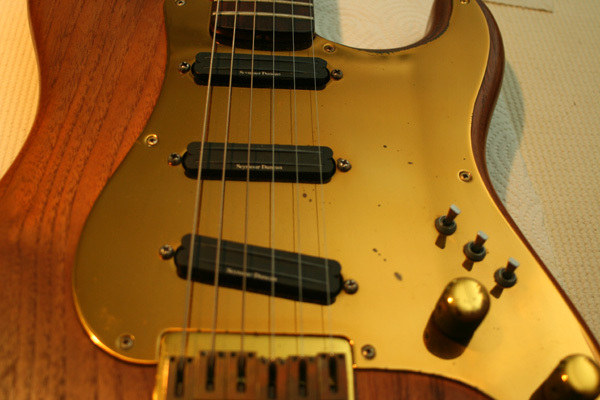 It was made for Scott Gorham of Thin Lizzy,but at the time he played Gibsons and did not really like it. Guten Abend Ingo, Bitte können Sie etwas über diese zufällige völlig unabhängige Kommentare auf der Website tun. I have a dream machine shechter as well 1985.im willing to sell for the right price.